I bear witness that there is no God but He who came among us in the Person of the Great Mahdi, the self-guided one, Master Fard Muhammad to whom praise is due forever. We thank Him for His most honored servant, his Messenger Messiah, the Exalted Christ, the Honorable Elijah Muhammad. This is no time for us to tremble and shake. This is the time for us to sink our root deeper into our faith that there is no God but Allah and that Muhammad is His Messenger. There’s a lot of madness out there now. I’ve seen and heard many on social media desirous of my death. Everybody has to die. But nothing you can say or do will put a death to the man who is speaking to you now. Almost everybody wants to live longer but cowards are already dead. Most everybody would like a long life—Martin Luther King said that too, but they are still talking about him. He’s outlived those who wanted his death because he made an impression on those who lived and for generations to come, they will speak his name. I’m in that company. I thank Allah for our trip to Iran. I thank Allah for all those who went on that trip with me. I want to tell you why I went. The Middle East has a lot of cleansing to do. The Arab world has a lot of internal cleansing to do. Before the Prophet, peace be upon him and I’m speaking of Muhammad Ibn Abdullah, passed from this earth he said to the Muslims: There is no superiority of the White over the Black. There is no superiority of the Black over the White. The one that is most careful of his or her duty to Allah that’s the best among you. But you know Black people have been under foot so long. Some White and light-skinned people think Black people are born to be under the foot of others. I’d like to disabuse you of that foolish thinking. We are only under foot because Allah pleased that we would be under foot, not because we had done something wrong, not because we were wicked. But God allowed the White man to put us in a condition that only He (God) could bring us from. And He allowed that so that the world that had been talking about God and believing in Him as a mystery; some spook that inhabits space, the real God would show up in a country that the whole world feared; the most powerful nation in the history of the world with enough weapons—nuclear, hydrogen bombs—to kill the inhabitants of the planet 30 times over. God allowed a condition to be setup with a country that nobody could sit down and a people that nobody could raise up. But He came by Himself. He came to raise us up and to bring our enemies down. He’s so powerful that He took every weapon out of our hands in the midst of the most armed, well-armed people that have ever walked the face of the earth—350 million Americans and 370 million guns. He said to His Messenger Messiah, you don’t carry any weapon because they haven’t made a gun big enough to shoot you from here to across the street. That same man took weapons out of our hands, out of our pockets and out of our houses because He was powerful enough to defend us from our well-armed enemies. Then he gave us a word, an invincible truth, that no human being on the earth is able to defeat because we know the origin of all of you. So your temporary lust for your color that you want to make America White again. You better resolve yourself to try to make America right, not again, because she has never been right since the beginning. God is very patient. Whenever He delivers His judgment on a nation, He gives the people time to acclimate themselves to His judgment. You can read it in the Bible, you can read it in the Qur’an when God raises a Warner, a Prophet, a Messenger with that Prophet, with that Warner, with that Messenger He sends down His judgment. If the judgment is destruction for that people, that nation, that empire, out of His nature of mercy He gives the wicked time to correct their course and avert His judgment. But the oppressed in that society He gives them time to accept His judgment. Most of you are sick with love for your enemy. I look at you on television defending your wonderful right to vote. And as I love you, I know that you hope that your presence in the Congress, or your presence in the Statehouse, or your presence in the City Council and your presence in the police force as Sheriffs and Chiefs, in your heart you hope to make things better. God gives you time to wear yourself out. God gives you time to try your ideas; to try your powers to see if you can make His judgment a lie, and the prophets who prophesied the judgment as liars. He’s patient. But His patience does not last forever on both the Wicked and the Righteous. You have time because he chose you out of the furnace of affliction. He’s calling you out of this: Come unto me, He said, all ye that are heavy laden, I will give you rest. My poor brothers and sisters you want fame, you want fortune. You want really to be seen of men. Satan just comes right at you in your desire. He tricks you out of your salvation that is with God, and you allow His (God’s) enemy, the Devil, Shaitan, to offer you false promises. Promises that he doesn’t even have it in his heart to fulfill, just to string you along and keep you hoping that maybe one day Black and White will be together. Maybe one day we’ll be brothers and sisters of each other; maybe one day—it will happen but not on their terms. God has His terms for peace with Him. You can’t bring God peace terms. You need peace in your life. You need to have some measure of security in your life. You need to know that your children will grow up and live a better life. Women need good men in their lives and men need good women in their lives. God will grant you all that you need but on His terms. I can imagine White people with all their power coming to God’s table with a bargain for their lives. Allah (God) wants me to tell President Trump, China and Russia and all you so-called leaders: He brings the terms for peace with Him because He has power to kill you all. That is easy for Him to do if you travel in the land and see what was the end of the rejecters of God’s terms for peace. But what happens when you’re empty inside? What happens when you’re famous and you can get all the women you want and you’re trying to get as many as you can? You end up a wasted man—babies everywhere but no care for them. You end up in your solitude in the darkness of your dungeon that may be a million and a half dollar house but it’s a dungeon for you because it looks pretty on the outside like America but on the inside is filth and abomination of every kind. A house isn’t a home and a dungeon is not paradise when you’ve lost your soul. Remember when we were young mama gave us a prayer to say. “Now I lay me down to sleep, I pray the Lord my soul to keep. If I should die before I wake, I pray the Lord my soul to take.” There’s a precious part of your being, it’s an unseen reality but it’s the most precious part of who you are. It’s the essence of yourself; when you compromise your principles for some gain somewhere you’re throwing dust on your soul. When you go before the world but you’re not one with yourself that means you don’t have integrity. Because in the word integrity is the word integer and an integer is a whole number. How many of us go in this world without being whole? You’re hiding a part of yourself to gain some advantage over here, some advantage over there. You can’t expose the fullness of who you are because your desire is causing you to lose your soul. So most of you are empty; a doctorate degree but empty. How could you work so hard for so many years for a degree and end up feeling empty? Because your focus was off from the beginning. You want this; I want to be that, I want to go there. But if you’d only said I want to be right. If you had only said God help me to be made right. You gave me everything I needed when I came to birth in this world but what I need now to complete my make is to be made right. All that you have is not giving you one second of peace and contentment of mind because you’re not right and not even trying to be right. All your wasted energy is ruined by being other than your true self. It could be accepted of you when you didn’t know yourself. It’s not acceptable today when you know that your self is a righteous person but every day you compromise yourself for some advantage in the world that is closing down. In Madison Square Garden, October 1985, there were so many people, they lost control of the doors but outside the door there they were. “Who do want? How do you want him?” That was thirty-six years ago. Well, evidently somebody is not your shepherd. Because if the Lord were your shepherd you would say the Lord is my shepherd I shall not want what I cannot gain. But I’m still here. You know in the Bible and in the Qur’an there were times when the Man of God would call out the Baal prophets for a showdown. God’s man he has an inside scoop with God. He told the false prophets, “put some wood on the altar there. I want you to call on your God and bring down fire from heaven.” Just a little showdown. They, the false prophets, called and they called. No fire came down. God’s man said, “well tell you what, put some water on the wood; get some more water and put it on the wood.” And then his God, the God of Elijah sent down fire from heaven. But it didn’t stop there because they had wanted Elijah dead. When they couldn’t bring the fire down from heaven, Elijah told his disciples take them down by the river and kill them all. My teacher on June 11, 1972 in the “Theology of Time, Lecture Series” said, “I’m the little boy that challenged the world of science to disprove just one word I say.” … He put himself down because he’s talking to arrogant jackasses that think themselves to be so wise. All your wisdom is foolishness with God. You don’t have a teacher like that. All you religious scholars and scientists, you don’t have a teacher like that. He said, we must not lie in this day. It’s the end of this world. Since they have been the master liar, we must not become any minor liars in it. … A lie may not be a big liar but you’re a damn sure a minor liar. But all lies and liars have to cease. They told me that from Iran that I called Mr. Trump Satan. Did I say that? In the Church we all say the devil is a liar. Well if a man lies every day, several times a day, who the hell are you looking at? Mr. Muhammad taught us about Yakub, the father of the White race. He really taught the devils lies. He was a Black scientist. He’s the god of this world. He’s a liar. As by one man sin entered into the world and death came also by sin. It wasn’t a spook, it was a man. White people are grafted out of the original; this is science. That’s why he challenged the scientists because all he’s teaching is science. Why isn’t the White man a native anywhere? You’re not a native Palestinian. You didn’t originate there. But if you did you’re the real Semitic people. But the Ashkenazi European he has no connection at all to the Holy Land. So in a showdown prove to us that you are Semitic. Now you students of anthropology don’t bring that crap to me that I’m some son of Ham. I’m one of the Hamitic people. You keep that crap to yourself because I know my origin in the world and I know yours. We are not from Ham. We’re the ancient of days, having no beginning of days or ending of years. That’s why Jesus could speak and he was no White man. When they talked about Abraham, Jesus said before Abraham was I Am. So everybody has to get in their place today. All that Middle Eastern area was once Black. All of it, not some of it. They can fool the masses who don’t have God’s wisdom. You call it Saudi Arabia. Look at the people. They’re not the original Meccans, no, they were Black. I discovered something in Iran. I was whipping one of my hosts. He told me I don’t believe that Fard Muhammad is Mahdi. He said it with strength. I said I can understand that, you’re just hearing it. I said a great ship doesn’t turn in the ocean like a little boat. When you have a great ship and you’re trying to turn it, it takes time for that rudder to make that ship turn against the power of the ocean and the water that’s being displaced by its turning. So, I understand that it takes time but I didn’t come here to ask for anything. I came to deliver a message. At first, I wasn’t going to go at all. I had the invitation. I didn’t really want to be bothered. I’m just being truthful because I didn’t like the way I was handled the last time I was there. The man that is self-respecting will not allow you to disrespect him twice. They invited me three years ago to speak at the celebration of the revolution which I did 22 years ago under President Rafsanjani. I’m the first, probably the only outsider that was given the privilege of speaking to six million Iranians in the Square and 60 million over radio and television. I have to tell you I was walking toward where President Rafsanjani was and they were chanting. Marg bar Amrika! Marg bar Israel! I said “damn.” But if you’re in a crowd and you’re an American; American Black Muslim and somebody is crying death to America. I’m in the middle of the crowd and they’re shouting. Go back and get the speech that I delivered. Right with the president sitting right there I said, you can’t defeat America or Israel with a chant. I said chanting is not going to get it done. I said your problem is not America. I said your problem is not Israel; your problem is your deviation from the path of the Prophet. I spoke at the University of Tehran. And I would make a point they would shout Marg bar Amrika, Marg bar Israel. I couldn’t make a good strong point without the chants. So I stopped and I said again deviation from the path of God is what takes away your power to do what you want done. Twenty-two years ago I said that. Now I’m in the University of Tehran again. I make a good strong point and they chant … “It’ll be in the New York Times tomorrow Farrakhan came back and led a chant.” I told them no, we are not chanters. We’re doers of the Will of God. They wanted me three years ago. They said to speak at the celebration of the revolution. They put it in the media, it was all over the world. The day before the celebration, they had 500 scholars coming and they wanted me to speak to the scholars. I said fine. But when I got there something happened. On the day before I couldn’t speak before the scholars and on the day of the Iranian celebration, they came to tell me that I couldn’t speak because then-Secretary of State John Kerry had called Iran to tell them it wouldn’t be good for our relationship if Farrakhan was allowed to speak. So I started whipping my host. I said now I can’t go back to America and tell them that you lied to me. You’re hearing it now for the first time. I can’t go back home and tell them that you allowed this man from America to call you and you disrespected me because he called. We can’t build any relationship like that. I left there. I never said anything because I didn’t want them to look bad. They’re a little better now. But when they asked me to come back I said, “I’m not going.” I told Brother Abdul Akbar Muhammad, you go. Then he wrote in an email telling my host but he didn’t send it. I said, no don’t send it because I might send somebody else to speak. But anyway I wasn’t going. The invitation was in my hand for three and a half weeks. And then Brother Akbar Muhammad and my son Mustapha Farrakhan came and said, you know Brother Farrakhan from Tehran you could give a warning to Tehran, to Mecca, to America from that spot. I thought about it and I told them call over there and tell them that the principal has decided to accept their invitation. I still wasn’t convinced. I told my son you go in front of me, because if there’s anybody that I can trust it would be my son. I said to my son, you make all the inquisitions and questions and then you call me back and if you say that I should come I will come. Members of the delegation that accompanied Min. 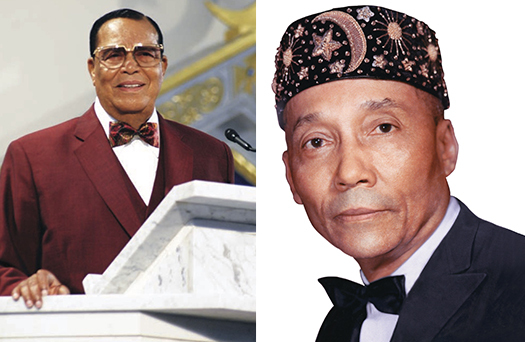 Farrakhan to Iran included: Leonard F. Muhammad (inset.) and from left to right; Supreme Captain Mustapha Farrakhan, Asst. Supreme Captain Anthony Muhammad, security team members Melvin Muhammad, Donald Muhammad, Darrell Muhammad, Benny Mahdi Jr., Emil Muhammad and Thomas Muhammad; Imam Sultan R. Muhammad, NOI Inter- national Representative Akbar Muhammad; Final Call video team Warren Muhammad, Robert Muhammad, Final Call editor Richard B. Muhammad and Hassan Muhammad. Min. 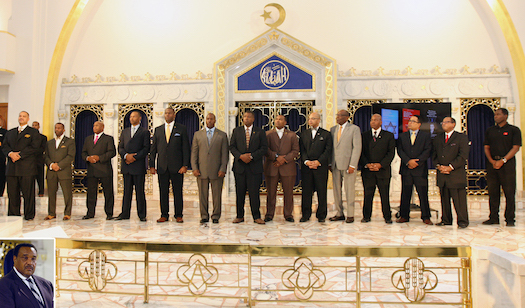 Farrakhan’s grandson Mustapha Farrakhan Jr. also accompanied the delegation. Some members of the delegation got to Qatar but the foreign ministry was slow in sending visas. It was because there was a problem. America knows it has created a problem. So problems when you’re facing war need to be addressed because you can’t go to war and the inside of your house is at odds with each other. So I went when my son said it was alright. While I was on that plane, as Allah is my witness, I was in the business section. I started to pray. While I was making my du’a (prayer), talking to Allah to help me, He interrupted my prayer. Since I’m talking to Him (Allah), He could interrupt me because I was asking for guidance. I’m beyond lying. Lying destroys my integrity and therefore I should never lie because you can’t do a damn thing for me and you can’t do anything to me. He, Allah, interrupted my prayer. I didn’t hear voices but it was like sending a thought. He said, “You’re in the right place at the right time. And just as it was with Prophet Muhammad, Peace Be Upon Him, he sent messages to the Chosroes of Persia, to the Cesar of Rome, to the Negus of Abyssinia, and to the rulers of Egypt. That came right in my mind: “You are in that frame now.” I’m not going there to ask for anything. I’m going there now to deliver a message. What is the message? I told my enemies at the press conference: “I don’t say nothing in private that I’m afraid to say in the public.” Allah says in the Qur’an, “speak straight words.” If you can’t speak a straight word, it’s because you’re crooked. Iran is Old Persia. I had a message to deliver from my father. I knew what happened to the Messenger who delivered a message to the Chosroes of Persia where Muhammad wrote and said he was the Messenger of God and that if the leader of Persia submitted to the Word of God, there would be peace, there would be security. The leader of Persia didn’t want to hear anything from Muhammad. The way Muhammad had his name written, it was above the name, so says, Maulana Muhammad Ali, of the Chosroes of Persia. He was so angry, he tore the letter up and sent his soldiers to get the messenger who brought it and kill him. The first meeting that I had with the Society that invited me was a former general, Mohsen Rezaee, the secretary of the Expediency Discernment Council, who’s very close to the Supreme Leader. I think we may have my words. I spoke to him of the man Iranians are looking for, the man they’re praying to see, the man they teach from the cradle to the grave that you wish to be martyred for Imam Mahdi. I said, “He came and visited with us.” I got in it so strong. I said, “Now, you can do with me what you want to” because I knew what had was done to the man that delivered the message 1,400 years ago. When I went before the Supreme Leader in his compound, the room was full of ayatollahs, generals, high level people in the government. I didn’t know that at first, but I guess everybody who was somebody in Iran was there that day and it was my time to speak. I am so thankful to Allah that he gave me the words he wanted me to say. Like the scripture says, Reverend, he came without observation, like a thief in the night. I said, “He came looking for one man. Although he named 25,000 in Detroit and gave them their Holy Names, but the one name that he wanted was Elijah. His slave name was Poole and He named him Karriem, and then He called him Muhammad. And Elijah Muhammad said, “This man traveled to every inhabited part of our planet. He spoke 16 different languages and wrote 10. He pictured and extracted the language of the people on Mars. He spoke the language of the birds. And He taught us of life on seven of these inhabited planets.” This is your brother talking to the Supreme Leader. I said, “He pointed out to Elijah Muhammad a dreadful looking plane in the sky, a human-built planet, a half a mile by a half a mile with 1,500 little planes in it that are designed to destroy America from the face of the earth.” I said, “Elijah Muhammad was with him one day and he asked him: Who are you?” And he said, “I am Mahdi. I came to guide you to the straight path that you may be successful.” Yes, I said it. Why did I say it? Because that nation is a nation devoted and dedicated to the Mahdi. That is a nation looking for the Mahdi. That is a nation committed to give their lives at the pleasure of the Mahdi. Iran is the only nation on earth that is trying to be a true theocracy. Saudi Arabia isn’t that. Jordan isn’t that. Egypt is not that. They are Muslims, not theocracies. Iran is trying to live its life according to the word and the will of God. They are that in the East and we are that in the West. I went from there to the Holy City of Qom where they make imams and mullahs and Cadis and scientists of Islam. I met the Grand Ayatollah Naser Makarem Shirazi and I started in again. I got so wrapped up I started to weep. Tears came in my eyes. They brought me a handkerchief and I wiped my eyes. When I looked up, they brought the Grand Ayatollah a handkerchief, too, because tears were in his eyes. Let me tell you something: You that go overseas seeking money, rather than telling them who you are and who came to visit us and educate us, you end up being another slave. I took up the subject in the Qur’an, “You are the Best Nation raised up for Men.” You enjoin good and forbid evil and you believe in Allah. And if the people of the Book had believed, it would have been better for them. Some of them are Believers but most of them are transgressors. So, who is that best nation raised among men? They forbid evil and they enjoin good. I think you’re visiting that Nation. Here’s a nation. You don’t find us, the Nation of Islam, killing one another. We do not strike our women. I’m not going to lie. Some do. We’re not perfect and when we find them, we discipline them. No man is to raise his hand at his wife. No man. We’re trying to be a good example of that “best of nations.” No guns. We don’t use weapons. Our weapon is truth. Our weapon is righteousness and the backing of God. I thank Allah for bringing us safely home. I’m trying to talk to and confront my enemies. I’d like to get Don King, perhaps Roc Newman could work with him to promote it: A showdown at Madison Square Garden. A Show Down. Why not? We’re ready to die for what we believe. 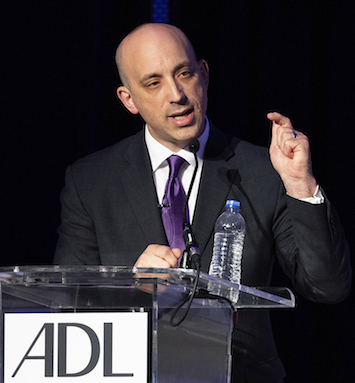 So, come on out, Mr. Jonathan Greenblatt, National Director and CEO of the Anti-Defamation League, and former ADL leader Abraham Foxman. Come on out Atty. 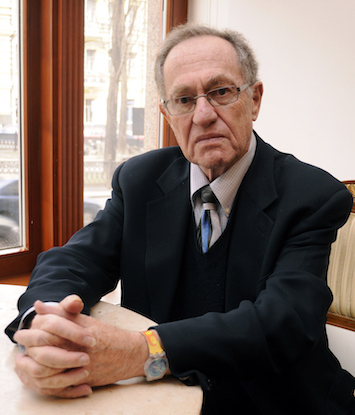 Alan Dershowitz. Come on out you that say we are haters and anti-Semites. Come on out from your hiding place. Leave your Negroes at home. Come on out. You think that the Nation is only Louis Farrakhan? You think that I’m the only one that can battle this enemy and beat them down. We’ve got stars here. Come on out since you love to say we are the haters. Come on out and prove it. We have your history. We know who you are, and we’ll be glad to share that knowledge with you. And by the way, we won’t kill you, even though you may be worthy of death. We won’t kill you. If you lose, and you will, why don’t we talk about what God wants and what you can do to help? Mr. Trump, God wants his people. I’m sad looking in the faces of those who are suffering under the chastisement of God. If you’ve never had your home burned down, everything that you own burned down in a fire, you can’t know what people are suffering. And they’re suffering because they won’t let us go. Your suffering is going to increase because you won’t let them go. Now, God is going to answer what I’m saying. These disasters are going to get worse until the modern Pharaoh says, “All right, Jehovah, come and get your people.” But you are so hateful of the future that Black people have if they separate from you. Don’t worry about, “where we going to go?” You should tell them to worry. Where they going to go? Each of you watch the natural disasters that are going to increase, and God is going to bring heavier chastisement on us to force you to agree with his judgment of America. More thunder in your life. More police brutality in your life. More going to the bank and he’s not going to loan you money to fulfill your desires. It’s going to get worse and worse until you say, “God, I surrender.” And when your enemy says, “I can’t take no more,” then you can call the Minister and tell him you’re ready. Let’s make a deal. You deserve something better. No matter what you do of good for yourself, you’re involved in a corrupt and rotten system. So, whatever you do it’s limited, and God doesn’t want limited good for us. He wants to open the door of heaven for all of us.